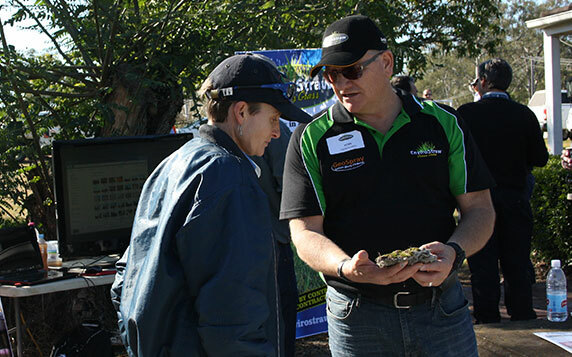 Developed by leading Australian soil scientists, EnviroStraw products are proven to revive soil, control erosion and establish native vegetation anywhere. Even the most depleted commercial sites can be revegetated in a self-sustaining way with increased levels of soil carbon using our products, which contain built-in nutrients for sustainable growth and work faster (with less water) than standard hydromulch. EnviroStraw products are Australian-owned and manufactured. Our chemical-free revegetation products have been carefully developed to accommodate all land sloping variants. 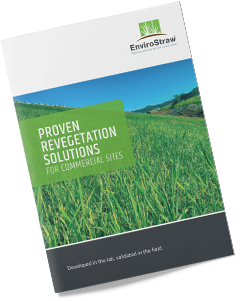 The EnviroStraw range consists of 4 revegetation solutions. Product selection depends on slope and site requirements, with each solution combining various key ingredients to quickly establish vegetation. A hydromulch that includes a biotic soil amendment and our agronomically designed soil conditioner. This thermally processed ‘straw blended fibre’ provides the ideal environment for controlled release and efficient nutrient uptake for establishing vegetation. Our signature hydromulch with added binders for more efficient uptake on steeper slopes. For highly problematic soils that are very low in carbon, our hero product also includes 22 specially selected strains of beneficial bacteria and fungi with other essential nutrients - designed to help rebuild disturbed soils, increase soil carbon and improve soil health. Ideal for revegetating all areas including extreme slopes. An alternative to geofabric that eliminates erosion caused by water, rain or wind. Using a spray-on technique, GeoSpray removes the labour-intensive, time-consuming and costly issues associated with laying geofabric, and exceeds all industry specifications.